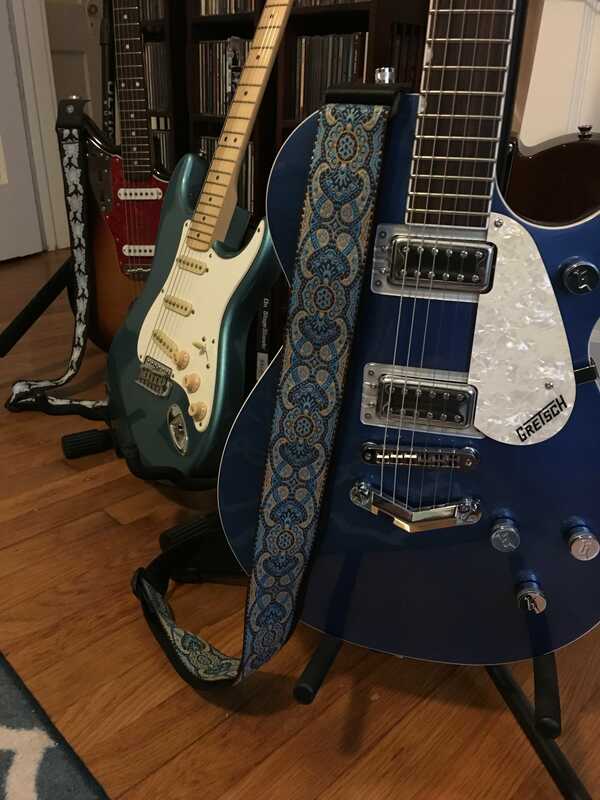 I've always been intrigued by Gretsch, I guess, because Johnny Marr, John Squire, and Martin Gore (from Rob Roe's favorite band of all time, Depeche Mode) used them quite a bit. So, I wanted one that wasn't one of the huge jazz boxes as I'm a short dude and it just wasn't comfortable but I've always liked Filtertrons, so the Pro Jet made the most sense. Super comfortable for me to play even though it has a more substantial neck (not chunky, though) than my Classic Vibes or Jag and sounds great. And it's freaking blue although I suppose I would have been even more tempted by Cadillac green metallic. Sam Ash gave me a reasonable trade in amount for my acoustic and I stayed within my budget, so I went for it. 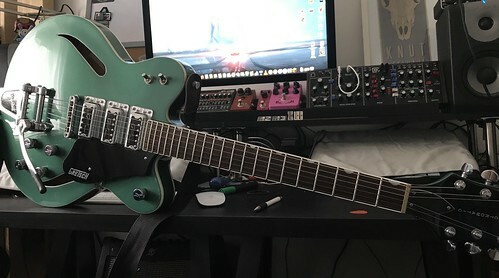 It's my first dual humbucker guitar (used to have a BT Jazzy with a Filtertron in the bridge) and it's taken some adjustments to get used to when using pedals, but it sounded really nice and big, but clear going through a cranked BD-2 and a Meteore reverb. Nice work and have fun! Those Blacktops are really good sounding mini-hums, and decent Jets for the most part behave like angry telecasters. It looks great. I like the V-shaped stop bar, it really suits the guitar. I've been rocking Gretsch lately too. I love the fact that on the hollow/semi-hollow guitars they come in a variety of depths, so you can have the cool wide body without it being as deep as an acoustic. How does the neck feel? I've only ever had a go on a Chet Atkins years ago and its size seemed to be overwhelming. Quite like the idea of their solid body models though. I'm been curious as well how the G54XX etc. models are myself. Proline G6128/G6129/G6121/G6130 Jet necks are tiny, almost as small as my CIJ ST68-TX, and most reissue Chets of all sorts are very reasonable and easy to grab. I as well have handled some monstrous vintage G6120 necks in the past, but suffice to say Terada Gretsches aren't of that sort. Even my modern oddball G6128T-DCM is a tad fatter than most standard models but is still quite a tidy package. I have a G5422, G5622 and the G2622, all of them are a little different, but all have a decent amount of heft (think chunky-ish C to shallow D shaped). similar to my Gibson guitars but much nicer to play. Feels just right for a wide bodied guitar. The G54 is a 2013 model and has the thinnest neck of the 3. The G56 is a 2014 and is perfect. It is sort of like a cross between my CV Tele Thinline (chunkier than the Custom) and the Casino Coupe and Epi LP Special I had but more comfortable. It’s a U shape with a 12 inch radius but still comfortable for my wee carny hands with sausage fingers. It feels substantial, to me, but not chunky or thick. Played this and a two tone red and white model with gold bling and the feel was consistent. If you guys watch Rabea from Anderton’s, he shredded on one for a demo for Riff City Music, so I think it would be a neck with wide appeal. Like that a lot. 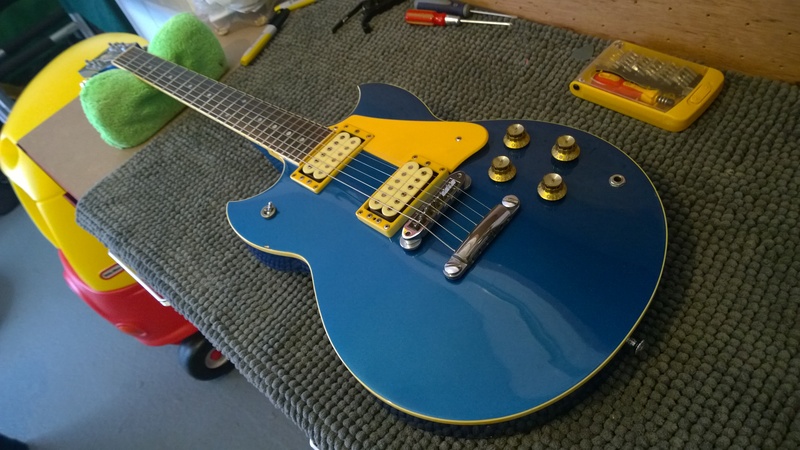 CME has a limited run of Duo Jets with a similar color scheme (midnight sapphire and gold). Beautiful guitar and was tempted but it had the standard Filtertrons and I wanted the Blacktop Filtertrons. I tried playing on of the thicker-bodied hollowbodies a few years ago and it was ridiculous--short dude, big guitar. If I eventually get one of their hollowbodies, it will definitely be one of the thinlines. Another thing that's a bonus is that these are chambered bodies, so they're actually pretty light. Heavier than my CV Strat, which is crazy light, but feels similar to my CV Thinline Tele. 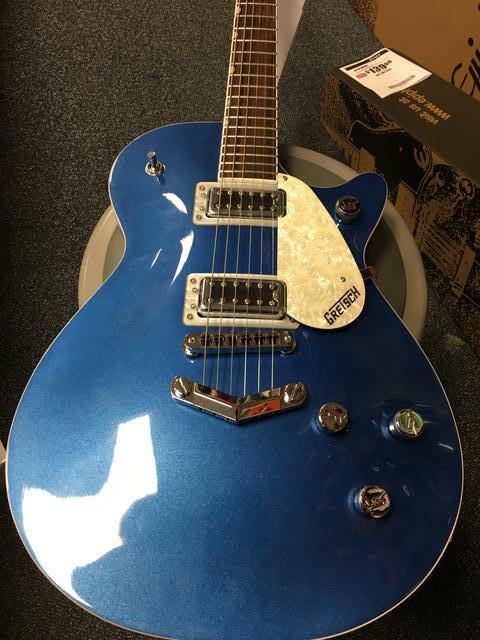 I'm going eventually add a Bigsby as I had a lot of fun with on another Pro Jet I checked out on Saturday. Country Clubs and single-cut Falcons are monstrous, to be sure. But if by chance you're ever tempted to go the reissue hollowbody proline route for the sake of that woody twangy goodness and somewhat decent prices on the used market, I wouldn't shy away from an FMIC-era G6122-1962 or G6120DC on account of body size. Think ES-335 in size with taller strings due to the Bigsby goodness, but depth-wise the body is just 1/4" (G6120-DC) and 1/2" (G6122-1962) thicker than teh Dotz. Of course the Players Edition Series are the modernized extreme that does away with more than a few inconveniences but are all the more $$$. Those who are interesting in Jets but a bit worried about price and playability should keep an eye out for the now-discontinued G5655T-CB models. Save the spruce center-block body construction, they're practically proline Gretsch models in quality and construction, and are wonderfully lightweight, resonant Jets with loads of tones. Here's a vid of a tangerine sparkle Pro Jet and a surf green one. It seems like this one of the few guitars that comes in a multitude of colors at this price range. You have the standard black, gold, and dark cherry metallic, and silver, but you can also find limited runs in Fairlane blue, midnight sapphire, surf green, natural, tangerine sparkle, cherry red/white two tone, dark green, and purple. I wish Squier would do this. Epiphone even does it a little. Thanks for the suggestion. That's substantially less expensive than the Bigsby + Towner bar suggestions I've seen on Gretsch Talk. I have a guitar from that range and can confirm they're quality.